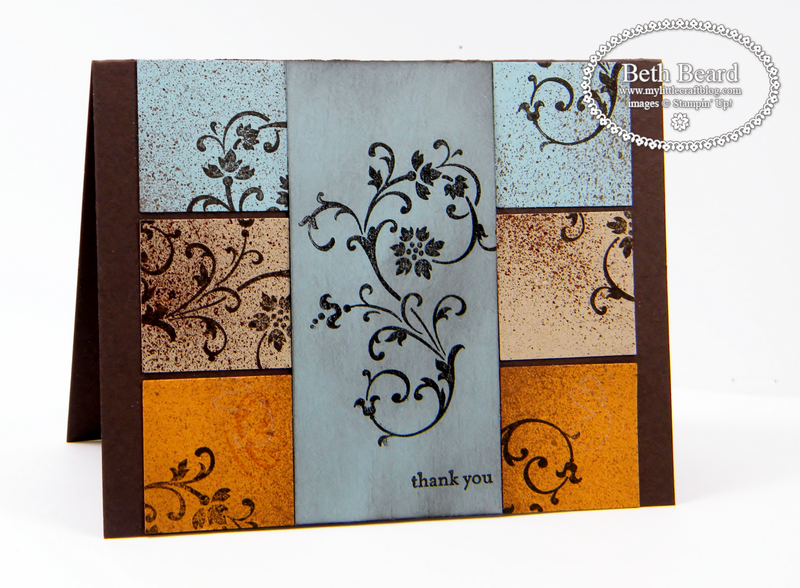 Today's card was made with Elements of Style stamp set, several scraps of card stock and highlighted with Log Cabin Smooch Spritz that adds just the right amount of shimmer to your project. Always use Smooch Spritz with the Color Catcher to protect your work surface from over spray. Especially if your like me and once you start spritzing, you can't stop. The Color Catcher has saved my work surface many times. It's inexpensive, easy to assemble and stores flat to save space. Layer thin coats until desired effect is achieved or layer different colors for added dimension. Use Heat Tool to speed drying time. I hope you have a beautiful & creative day! Great card Beth...with one of my all time fave sets....I do not smooch or frost etc (yet) but I do really like the effect.